Most hair formulations today just focus on the nutritional deficiency as the cause of hair loss. Nutrafol on the other hand is a nutraceutical formulation that goes far beyond traditional vitamins as it utilizes standardized, patented plant medicines & nutraceutical botanicals clinically prone to target very specific mechanisms (i.e. : elevated stress hormones & elevated DHT hormones). Regrow: Delivers nutrients such as marine collagen, biotin, vitamin A, vitamin D, etc. Using the latest biotechnology, NUTRAFOL® is formulated with patented, standardized and clinically tested nutraceutical ingredients. 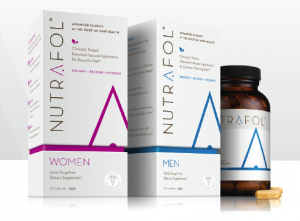 NUTRAFOL® leverages the multi-dimensional properties of potent therapeutic plants, and their full spectrum of phyto-nutrients to synergistically address hair loss. Enhance Nutrafol with PRP (Platelet Rich Plasma) and Theradome LH80 laser Helmet.